An amulet is an object believed to have magical powers. It is worn around the neck or ankle or in some other way carried on the body. The wearing of jewellery, some believe, has its origin in the practice of wearing stones and other kinds of objects to bring luck, to ward off evil, or to cure disease. A rabbit's foot is an amulet, carried in someone's pocket for luck. A horseshoe hanging above a doorframe is another example of an amulet. What makes an amulet an amulet is truly in the eye and mind of the beholder. To some, a four-leaf clover is just a plant; but to someone who believes it to be magical, it is an amulet. 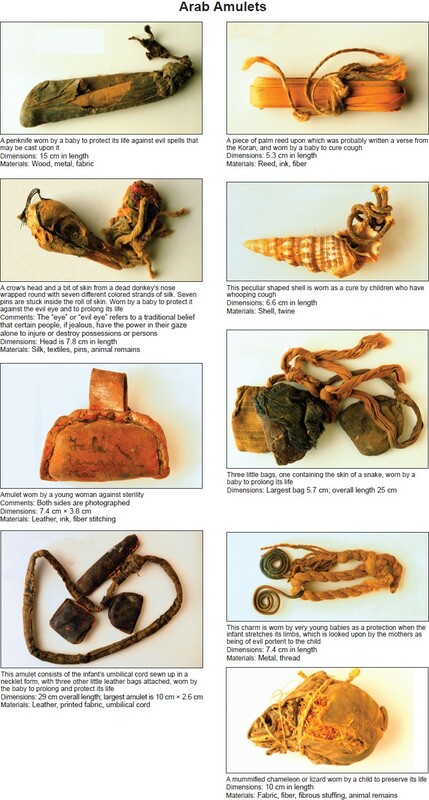 So far as we know, the amulets were made by and for people of the Islamic faith. Some of the amulets, including number 14 which consists of "blessed bread," (symbolizing the body of Jesus Christ) derive their powers from God and other spiritual agents. Amulet 2, a palm reed, has verses from the Koran (Qur'an) written upon it. These amulets are closely tied to religious beliefs and practices. Most of the amulets in this collection, however, represent folk practices not specifically connected to religious faith. Many parents used amulets to protect their children against the "evil eye." The evil eye, called "salty eye" in Persian, refers to a traditional belief that certain people, if jealous, have the power in their gaze alone to injure or destroy possessions or persons dear to someone else. The word for "evil eye" in Arabic means simply "envy." Because children were important to this society, as they are in most societies, they were as likely as anything else to inspire envy and needed to be protected. According to Edward William Lane, who wrote an account of the practices of Egyptians in the last century (1833-1835), parents would sometimes cut off a piece of a child's clothing and burn it with a little salt (to which coriander seed or alum might be added), if they noticed a person staring or seeming to envy the child. The parents would then fumigate the child with smoke from the fire or sprinkle him with the ashes.